Tickets in the second deck cost 270, 170 ($218), 145 ($186), 120, 80 ($102), 45 ($58) and 30 pounds ($38). A presale for Yankees and Red Sox season ticket holders starts Friday, and a presale for those who have pre-registered begins Monday. The general on-sale date is Dec. 6. 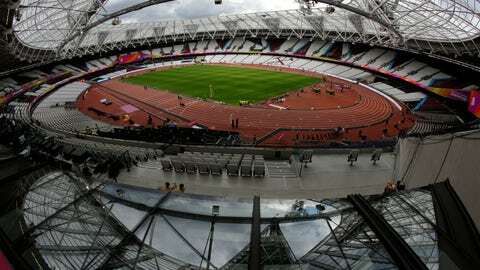 Site of the 2012 Olympics, the publicly owned stadium in East London was extensively remodeled for the West Ham soccer club, which starting playing there in the 2016-17 season. West Ham charges 80 to 55 pounds ($70) for category A Premier League matches this season, with discounts for club members and lower prices for category B and C games. Tickets for games between New York and Boston at Yankee Stadium in April range from $550 to $45, according to the team’s website, with premium seats costing more. Boston has not yet posted individual game prices on its website.